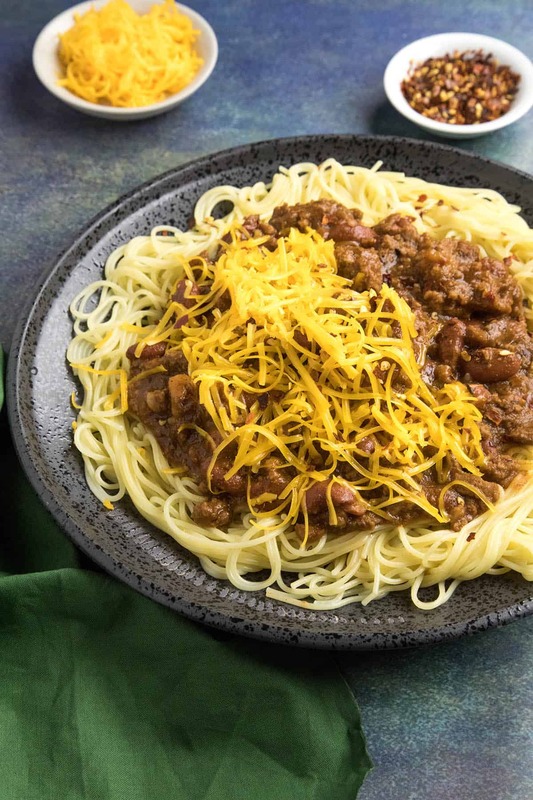 Cincinnati chili is a chili unlike any other, filled with a beguiling mix of Mediterranean spices and chili powder, a beloved regional favorite. Make it tonight with this recipe. 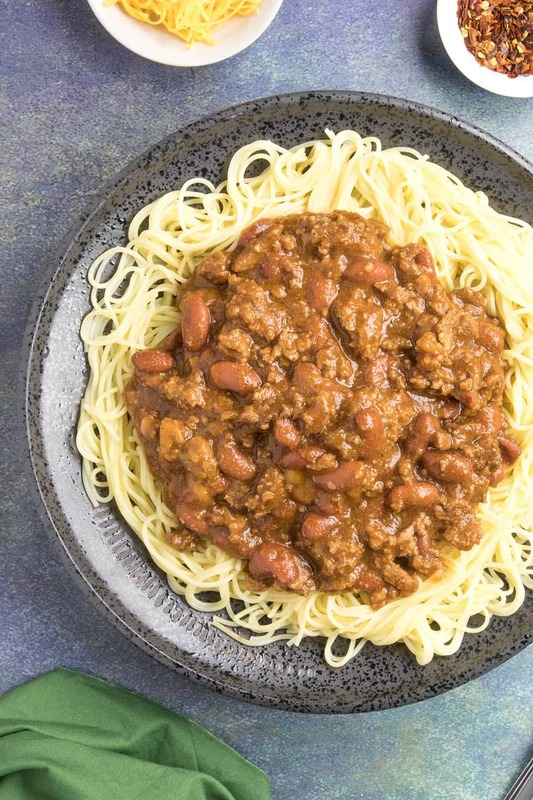 If you’ve never had Cincinnati chili, I urge you to give this recipe a try. Right away. Tonight. 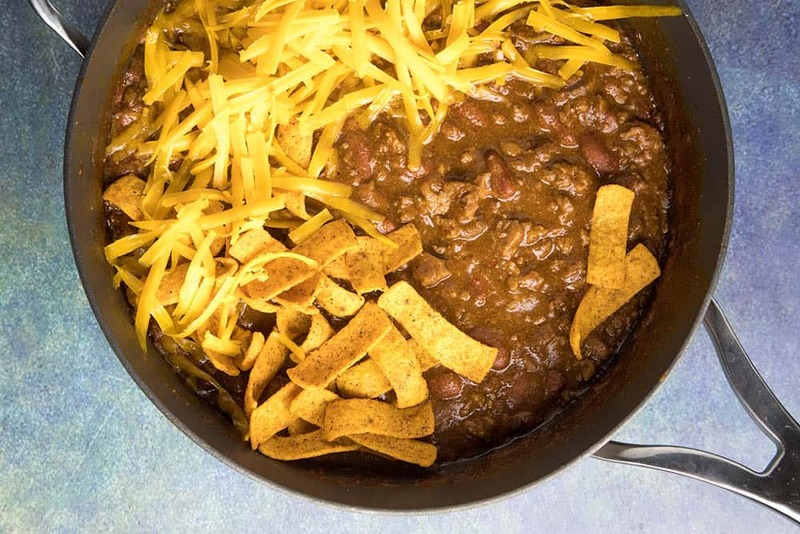 It’s a different sort of chili, so different from other chili recipes from other parts of the United States. 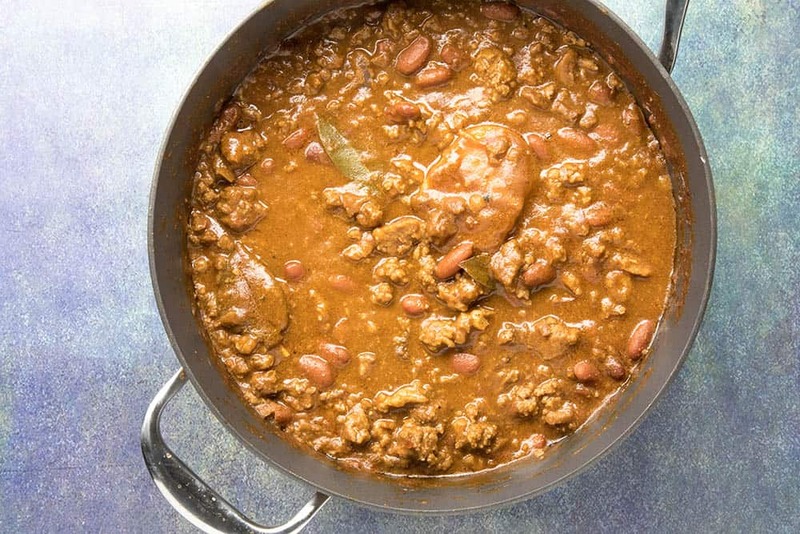 It certainly looks like a regular chili when you include beans, similar in appearance to something like Chili Colorado or even this Super Easy Chili Recipe, but you’ll notice the difference once you take a taste. 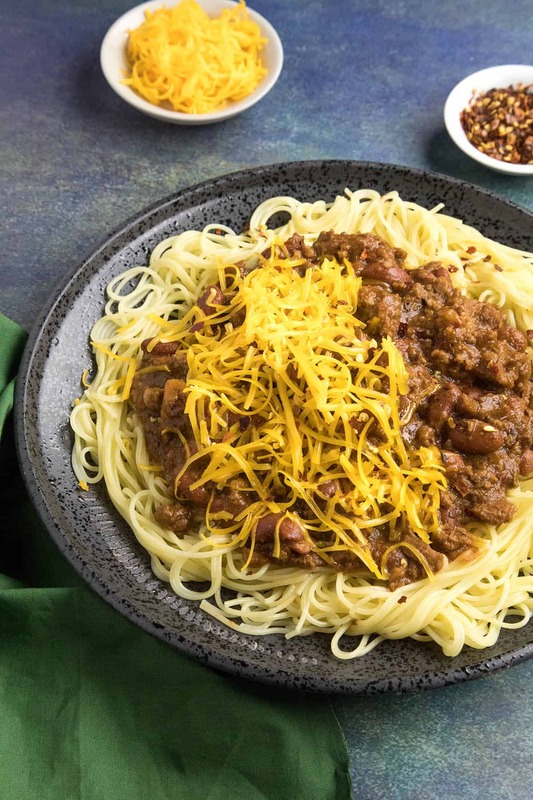 First off, Cincinnati chili is more like a meat sauce, like a bolognese, meant to be served over spaghetti or pasta. It is not a spicy chili. While it does contain chili powder traditionally, it is different in the other blend of Mediterranean spices that go into it. You won’t get that spicy kick unless you alter the original recipe, though you can include chili flakes and serve it with hot sauce. Instead you’ll enjoy an unexpected touch of sweetness that typically includes cinnamon, nutmeg, and clove, though other spices play an important part and, as with any recipe, variations do exist from cook to cook. This mix of spices works together quite harmoniously, and with your first bite, you’ll be pleasantly surprised. And potentially hooked. 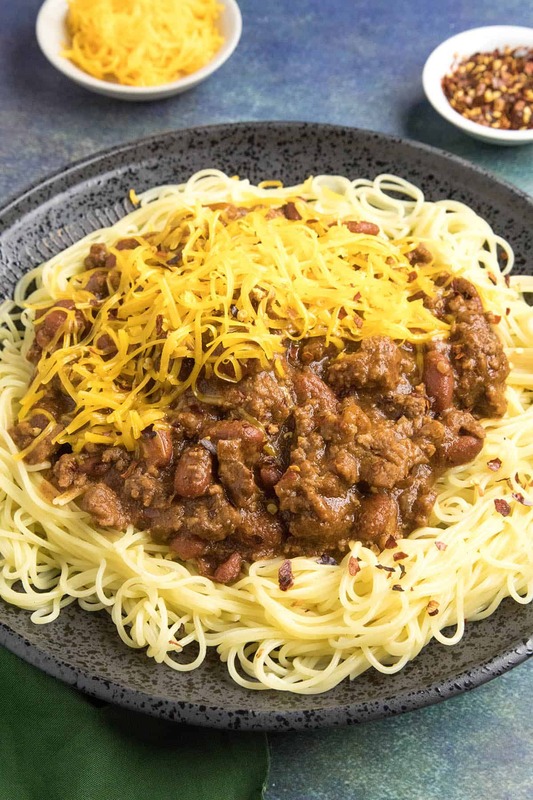 Typical ingredients in Cincinnati chili include ground beef, tomato paste, spices such as cinnamon, nutmeg, allspice, clove, cumin, chili powder, bay leaf, dark chocolate (though this is more of a home cook option), simmered in water or stock. Toppings include cheese, onions and beans, and sometimes garlic. 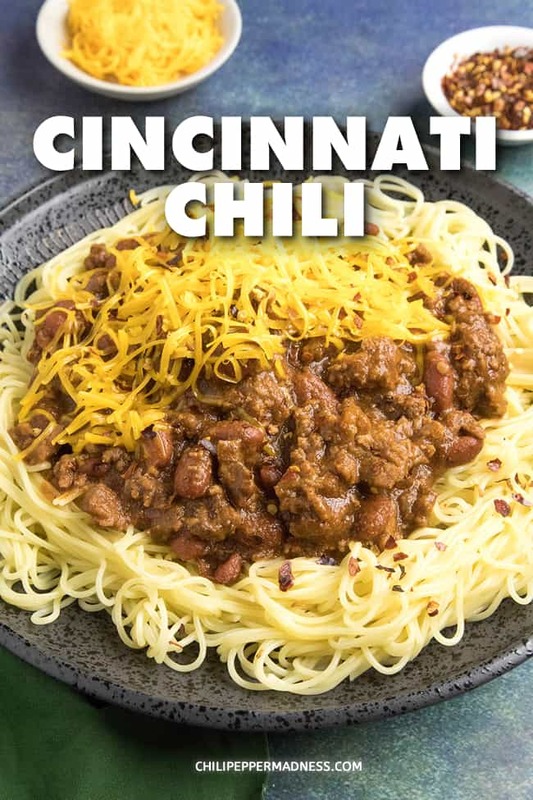 The story of Cincinnati chili starts with two brothers, Tom and John Kiradjieff, who immigrated to Cincinnati in the early 1920 from troubled Greece. They opened up the Empress Chili Parlor in 1922, and wanted to make something Americans would appreciate. 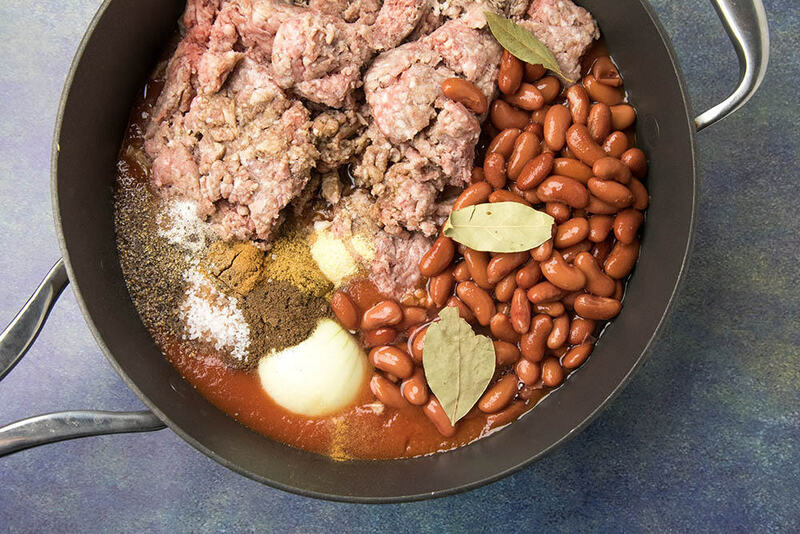 What they essentially created was a stew of meat seasoned with their familiar spices, added in chili powder and other local American spices, and served it up. The locals fell in love with the dish and have continued to go for serving after serving to this day. My Cincinnati chili recipe was given to me from a friend named Jerry I met as we were both visiting Florida. I struck up the conversation about making chili, and he said I MUST try his recipe, but he vehemently insisted I change NOTHING. No alterations. No substitutions. NADA! I have made no changes to Jerry’s Famous Cincinnati Chili recipe, so here it is! Combine the following ingredients in a large pot. Submerge the onion and break up the uncooked beef as fine as you can. Cook on medium-low heat, uncovered, for two hours, stirring every 20 mins. Everything will break down and meld together quite nicely. Remove onion and bay leaves. Looks just like any chili! Serving up Cincinnati is another way it is differentiated from other American chili recipes. Jerry and his wife, Pam, who adore their Cincinnati chili, love to serve theirs over spaghetti, but also on hot dogs, and with Fritos over the top. They also enjoy making their favorite “Walking Tacos”, which is in a bowl with some shredded lettuce, chili, shredded cheese, sour cream and Fritos. They also mix all of that up right into a small Frito bag. Nice! That’s it my friends! I hope you enjoy your Cincinnati chili! It really is unique! A chili like no other! Combine all ingredients in a large pot. Submerge the onion. Break up the uncooked beef as fine as you can. Cook on medium-low heat, uncovered, for two hours, stirring every 20 mins. Serve with your favorite fixins. Or, serve it over a hot dog with mustard, onions and shredded cheddar cheese. Very unique tangy flavour. Can’t wait to try some on hot dogs. I do have one complaint. You failed to warn of the mouth watering aroma that permeates from the kitchen causing everyone to go mad! True, Gerald! This chili recipe should come with a warning! Too good to wait! 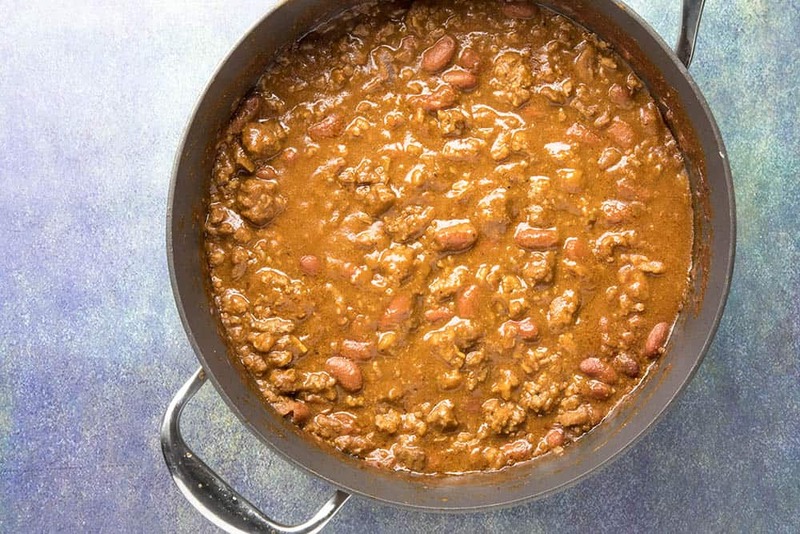 No wonder it also goes on hot dogs – except for the beans, it’s close to the recipes in many areas for hot dog chili, which also came from Greek origins, rather than Tex-Mex, like chili con carne. In most cities it was originally called hot dog sauce until the similarity with chili con carne lead to the name cross-over. Isn’t hybridizing of food traditions wonderful for the taste buds? It is fun, isn’t it? I love it! Looks yummy and delicious with all the amazing flavors. Love the recipe and need a try. This needs to happen for dinner! Looks so hearty and delicious! Quite hearty for sure! Thanks, Taylor. That looks like a really hearty and comforting chili. The sauce looks lovely and rice too. Thank you for reminding me it’s been way too long since I’ve had Cincinnati chili! And, thanks for sharing Jerry’s recipe with us, I won’t change a thing! Thanks, Pam! Jerry don’t want no changes! Haha. Excellent! I can see how it’s an acquired taste, so I’m glad I loved it at first taste!